Seattle native Craig Bartlett’s third show for kids is now on the air — “Ready Jet Go!,” which is set in the semi-mythical Washington town of Boxwood Terrace. It mixes stories of friendship with information about space and science. PASADENA, Calif. – For his latest animated children’s TV series, Seattle native Craig Bartlett chose a setting not far from where he grew up. 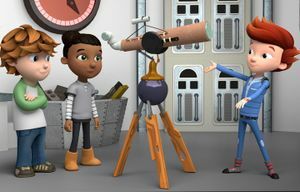 PBS’s “Ready Jet Go!” (7:30 a.m. Mondays, KCTS), a space- and earth-science series aimed at children ages 3-8, is set in Boxwood Terrace, which Bartlett imagines as an idealized, small town off Interstate 5, inspired in name by Mountlake Terrace. “Ready Jet Go!” marks the third series Bartlett has created after Nickelodeon’s “Hey Arnold” (1996-2004) and PBS’s “Dinosaur Train,” which continues to produce new episodes. “Ready Jet Go!” focuses on Jet Propulsion, an alien boy from the planet Bortron 7, who looks like a human child. The series follows the adventures of Jet, his neighborhood friends and his parents. But it wasn’t always that way. 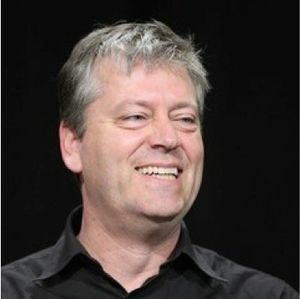 Bartlett dreamed up the show’s concept initially in the late 1990s or early 2000s while working with current PBS children’s programming vice president Linda Simensky at Nickelodeon and Cartoon Network. After working together on PBS’s “Dinosaur Train,” they revived talk of the alien kid project and how it could have a science curriculum that would make it educationally appropriate for PBS. From there the idea transformed further to include additional friends and the certainty that the lead character was an alien. In addition to two 11-minute animated stories per half-hour, each episode also includes two live-action segments featuring astrophysicist Amy Mainzer, who’s a curriculum consultant on the show. Bartlett’s long had an interest in space, and he interviewed astronauts for video used in the Shuttle Launch Experience attraction at the Kennedy Space Center in Florida. Bartlett lived in the Richmond Beach neighborhood of Shoreline until he was 12, when his family moved to La Conner, Skagit County. He graduated from Anacortes High School in 1974 and from The Evergreen State College in Olympia in 1981. He’s brought his childhood memories of running wild as a kid to “Ready Jet Go!,” sometimes depicting the kids on the show having unsupervised adventures. If Bartlett has one goal for “Ready Jet Go!”, it’s to give the next generation an understanding of Earth’s uniqueness, the fragility of the planet that’s being disrupted by climate change and how political borders disappear when Earth is viewed from beyond its thin atmosphere.